Libertad Fellow starts internship with Grassroot Soccer in Africa! Lena Forman (UVM ’08) — volunteer-extraordinaire for Futbol para la Vida (FPV) and Fundacion de Libertad over the last few years — recently started an internship with Grassroot Soccer in Africa putting to good use her Community Development major at UVM and all of her hard work on FPV (not to mention some great soccer skills!). 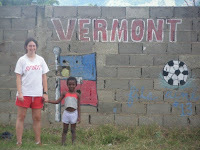 Lena is one of many UVM grads and Libertad volunteers who have gone on to work with Grassroot Soccer. Below is her first report from the field. Go Lena! Molo everyone! Hope you’re all doing well! Greetings from Cape Town, South Africa! (‘Molo’ means ‘hello’ in the South African language Xhosa.) I just wanted to let you all know that I have arrived safely. I’ve now been here for just about 4 days and it has been great so far. About 21 hours after I left New York I finally arrived in Cape Town. This city is absolutely beautiful! That’s what everyone kept telling me before I left but you really don’t believe it until you see it. On one side you have the Atlantic Ocean and many many beaches and on the other side of the city you have Table Mountain and other mountains that you can see rising behind all the buildings. My group and I are staying in the middle of the city for the next 3 weeks at a backpackers/hostel right on one of the main busy street in Cape Town. We are surrounded by so many restaurants and cafes and stores with every kind of food and goods you could ever want or need. On our first day we started off with something called The Resiliency Race which was almost like the show The Amazing Race. We broke into groups and had to try and complete a bunch of tasks all around the city worth different amounts of points to start to get familiar and comfortable with it. Some things included finding certain buildings or monuments, using a cab or minibus, going above 1000 feet, ask people to teach you certain words in Afrikaan and Xhosa (two of the main languages in South Africa…Xhosa is a click language). We also had to try to get an HIV test or see if we could find a place to. Overall it was a great way of learning our way around the city and finding out what kinds of resources are available to us here. A couple days later we visited the U.S. Consulate where we had a security briefing and got to ask questions about anything we were curious about. After that we drove to Boulder’s Beach in Simon’s Town and walked along the beach where we got to see penguins!! Who would’ve thought?! We also have had a full-day session about eco-shock/ culture-shock and things to help us along those lines in the next year. South Africa has such an interesting history and race relations (which I look forward to learning more about). It is so interesting to see how diverse Cape Town is. There are blacks (black Africans), whites (usually Afrikaan from Dutch descendents but also whites who are from British descendents), colored (mixed white and black), Asians, and Indians. I know outside the city this can be very different but I have been really amazed by the look of the city. It has also been really interesting to compare my experiences in West Africa (Ghana, Togo, Benin, and Burkina Faso) to what I have seen here so far. Very little of what I saw in West Africa can be compared to Cape Town. However I know that it has only been a few days and I have been in a very select part of the city and have yet to go out into the townships and other areas which I look forward to doing. In terms of the rest of the year, we still do not know where each one of us will be placed because the locations are still being finalized. Most of us will be staying somewhere in South Africa (mostly not in Cape Town) but a few will probably be sent to Zambia. We will not find this out, however, until toward the end of our training in 2 weeks. All of us have been so curious and we keep trying to guess what they’re going to do with us but we really don’t know. My group is really great…all very motivated and interesting people who are passionate about why we are here and also have a great love for soccer. Well that’s the update I have so far. I really just wanted to write to let everyone know that I made it here in one piece and say hi!